Susa was an ancient city of the Elamite and Achaemenid empires. It is one of the oldest-known settlements of the region, dating from as early as 4395 BCE. The archeological site is located in the lower Zagros Mountains. 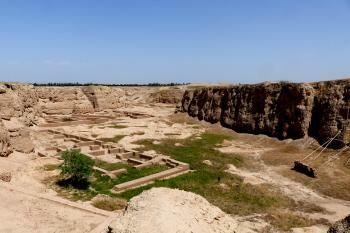 It comprises two components: Susa archaeological complex and the area of Ardeshir's Palace. Susa (Shush) isn't exactly the hottest place to stay overnight even if the guest house was just across from the museum and the restaurant around the corner made delicious food. It was getting late so the timing to visit the museum and archeological site was perfect. Surprisingly the place was open on a Friday with her Castle within not open and not on my list to visit anyhow. The staff were also super friendly, trying to sell me some books etc of course, the postcard collection for all WHS in Iran is interesting and some excellent shots but I don't collect these things and we all know they will miss some sites as early as 2019. The entrance is a little higher than usual because you get the museum at the same time. The museum was quite poor, containing items from other sites unrelated to the archeological site and even total rubbish like antique pistols. The main attraction is the large bull head at the entrance that once posed on a large pillar or something. You get to see a couple more broken pieces in the field. So making my way over there I quickly realized there isn't going to be much to see but low wall outlines where a large palace used to stand. The Apadana Castle must have been grand at one point but now it overgrown with weeds. The path extends far to a lookout where some locals were picnicking even before sunset. You get a lovely view into the dig site where more may be found at one point. However, at the bridge leading to said lookout was a plaque to talk about the statue of Darius found here. One would think this is in a museum right here but instead it is found in the National Museum of Tehran, disappointed. Sure, I saw it there, but what is the point of coming here then really. I am making a note to try and visit the National Museum in a country only after the tour through it. Thus I don't really want to recommend the museum/site but as it is probably on the way anyway it is worth a stopover. Susa is one of those Archaeological sites whose fame and significance outweigh what is actually “on show”. It was, as Wiki says, “an ancient city of the Proto-Elamite, Elamite, First Persian Empire (ie Achaemenid), Seleucid, and Parthian empires of Iran, and one of the most important cities of the Ancient Near East.” The normal visitor however is going to concentrate on the Elamite and Achaemenid remains - plus a number of aspects relating to its 20th C role in the history of Archaeology! During our “3 WHS” afternoon (Susa, Chogha and Shushtar) we gave it just under 2 hours. You will face the usual Iranian “multiple ticket” aspect – in this case 150k IR for the site (c US$4), 100k for the museum and another 100k for the “Fort”. We didn’t bother with the nearby separate location of “Ardeshir’s Palace” – the ruins of a structure built by Ataxerxes II to serve his needs whilst he was having the Adapana repaired after it had been destroyed in a fire, it contains the scant remains of a large columned hall but, from the underwhelming photos in the Nomination file, we decided to skip it in favour of more time at the main site. We started and finished with the Museum which is situated at the main entrance. 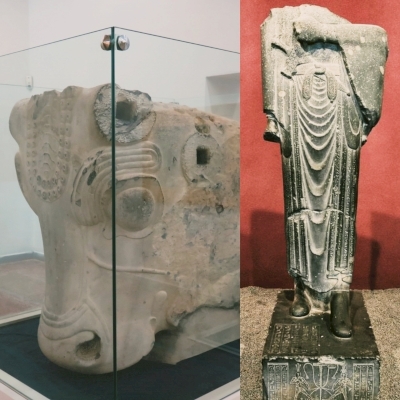 Some of its articles are copies of originals taken from Susa and now in the Louvre e.g various glazed panels such as the Winged Bull, but there are enough original items on show to make a visit worthwhile (its air conditioning is worth a quick “blow” as well – Susa is known for its heat!). These items stretch from the Proto-Elamite period through to the Parthian. The main site contains 4 main areas all within the same boundary - the Acropolis, the Apadana, the Royal City and the Artisan’s City. A trail takes in each except (as far as we could see) the last, and it is well marked with Farsi/English signs. Each constitutes a separate but linked “tepe” or hill testifying both to an original “rise” in the land and also to the centuries of occupation and rebuilding. The modern town of Shush with restaurants and souvenir stalls (this site is reasonably heavily “visited”!) lies right next to the Tepes. a. We started with the Apadana. This contains the Palace of Darius (of which the “Apadana” or “Audience Hall” is only a part). It appears that any previous Elamite structures at this location were flattened in order to create the vast level area required to achieve Darius’s vision (“Downward the earth was dug, until I reached rock in the earth. When the excavation had been made, then rubble was packed down, some 40 cubits in depth, another part 20 cubits in depth. On that rubble the palace was constructed.”). A large part of what is “on show” consists of low reconstructed mud walls setting out the shape of the palace and its many rooms but not displaying any details. The main audience (or “Hypostyle” hall) still has in position most of the 36 bases of its pillars, together with a few of the double bull-shaped capitals which held the beams (A famous inscription states that these were “cedar timber brought from a mountain named Lebanon”!). The location of the “Royal throne” which appears on so many Achaeimenid carvings is also identified. As is that of the famous statue of Darius which you may have seen in the Tehran National Museum (http://www.livius.org/su-sz/susa/susa_statue_darius.html ). b. After wending your way through other Achaemenid remains including a “pile” of miscellaneous carvings awaiting relocation (?) , you reach the “Ville Royale” where there is a deep cut in the Tepe reaching many metres below the previous ground level – this is the “Grand Trench” and takes Susa’s history back to the Elamites c1900BC (photo). 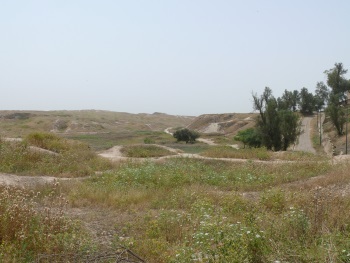 It is the work of Ghirshman (he of the Tchogha Zanbil excavations) across 20 years from 1946. In so doing he, for the first time, established a stratigraphic record of Susa across 15 “levels” (which explains why it is signed “The 15th City”). Apart from reconstructed walls a long way down, there isn’t a lot to take in other than to marvel at the amount of earth that must have been removed. c.	At this point, the path turns back towards the entrance and the “Acropolis” mound comes into view. Here again, apart from a lot of “craters”, there isn’t a lot to see apart from one amazing building – the “Chateau”. This is a mock mediaeval fort built in the late 1890s by the French archaeologist de Morgan as his living quarters, operational base and for security against marauding tribesmen! It was through him that France gained exclusive rights to excavate in Persia, and particularly at Susa, via an agreement with the then Shah, Nasr-al-din. The latter was paid for this and France gained rights to the finds – which explains both the long list of later French archaeologists working in the area and the fine collection of artefacts now residing in the Louvre! With some changes, the agreement continued through to the Islamic Revolution. Morgan concentrated in the Acropolis area but his post WWI successor, de Mecquenem, moved on to the Apadana through to WWII. Both have been criticised for their methods but were really only behaving as “of their time”. One thing I don’t understand is that it is often stated that the Chateau was built from historic bricks plundered from nearby archaeological sites – including Tchogha Zanbil (TZ). The former is certainly true, but, as TZ was only first identified in 1935 I don’t see how it could have contributed! We had been presented with tickets to the Chateau by our guide so we paid it a visit. A big disappointment. All the rooms seem to be occupied for admin purposes and one can only gain access to the Upper and Lower Courtyards in which a few left-overs from the digs are on show – some rails and carriages for moving earth and, rather incongruously, Roman Ghirshman’s (British!!) Land Rover from 1953 purchased to permit him to operate at both Susa and TZ! You would have thought he would have had a Citroen! The only item of more than passing interest at the Chateau that we found was a genuine inscribed brick incorporated into its walls - proving at least some of the stories of the provenance of materials used to build it! But this can be seen from the outside just to the right of the entrance door - no ticket required. And that’s it really. Before leaving the area we took in the Tomb of Daniel, situated a short distance from the main entrance and free to enter. It isn’t part of the inscribed site and is (almost?) certainly NOT his tomb, but it is a reminder of Susa’s connection to the Jews and to the Bible via the Babylonian exile. In retrospect? OK, there is not a lot to see in terms of detailed remains, artwork etc – this is certainly no Persepolis. But it still has its “on site” interests and provides a physical link to an enormous swathe of Middle Eastern history. Susa is not as spectacular as Persepolis but still has a lot to offer for tourists and archaeologists. The city is easy to reach from everywhere in western Iran and can be combined with a trip to Chogha Zabil and Shushtar. Being there, do be in a hurry, just let your imagination recreate the pre-Iranic civilizations of Elam. "In compliance with paragraph 61 of the Operational Guidelines, the examination of this nomination submitted before 2 February 2013 was postponed to 2015"
Damaged in War since WWII: The palace was badly damaged by shelling during the Iran-Iraq war. Famous Archaeological Trenches: Contains several remaining visible trenches. The most famous is described here - "At the base of his still gargantuan grande tranchée (measuring 100 by 40 metres), de Morgan realised that he had not by any means reached the primordial horizon that he sought" (link). There is also Ghirshman's "Stratigraphic Trench" known as "VR A" which uncovered the "Ville Royale". Alexander the Great: The "Susa Weddings"
Former Largest Cities: possibly the largest city around 3500 BC.